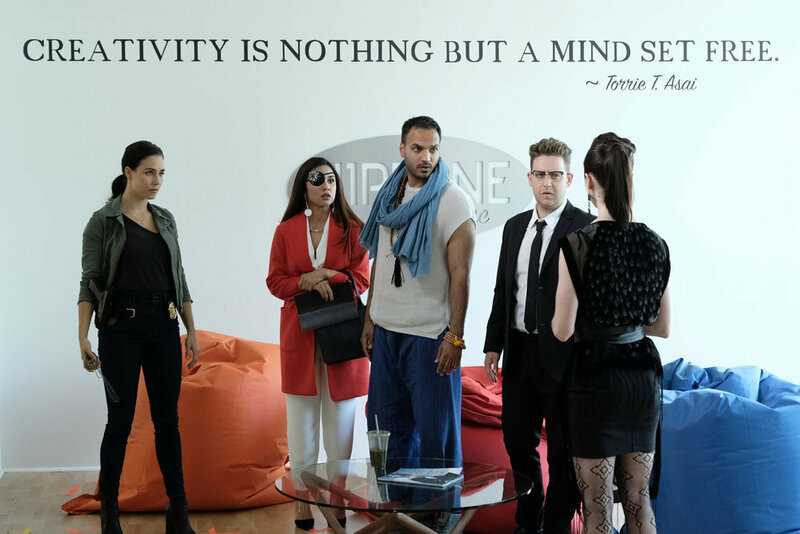 In the season four premiere of Syfy’s ridiculously addictive modern fantasy, The Magicians, things have changed for Quentin and the gang after having their memories wiped and given new personas as ordinary people. The Library now controls magic and everyone needs to petition for allotments. Alice is still imprisoned and the creature from Blackspire is now roaming free after hitching a ride inside Eliot’s body. Here are the biggest moments from tonight’s episode. The opening scene is a call back to season one when Quentin first gets his invitation to take the graduate program test Brakebills, except this time the potential new student is a woman named Kimber D’Antoni and instead of Eliot smoking a cigarette in a snappy vest it’s Todd! He even uses the same line and tells her that she’s late. Awwww. A very confused Kimber follows him and we are immediately clued in that this isn’t the Brakebills we know because Todd gives her a pro-tip to always be nice to Librarians since they control the good stuff. Inside the testing room, Kimber takes her seat and is greeted by Dean Fogg who explains that all questions will be answered eventually. However their task now was to finish this exam. As test booklets are opened, Professor Lipson monitors their progress on an enchanted scoresheet and we see that poor Kimber is getting a lot of x’s. The faculty member comments to the dean that the one who short circuited the globe isn’t doing well. Fogg breezily replies that because their magical supplies tend to run low at the end of the day, it could be reason for that strange occurrence. He then takes a look at potential student through one of his lenses and it cracks. Lipson thinks they should mind wipe her but Fogg disagrees and that they should keep Kimber on for now. He also suddenly has a terrible headache. Audiences though get a look at her through the broken glass and big reveal, she’s actually Julia! Meanwhile, ex-niffin Alice is still being held against her will inside the Library at the Neitherlands. 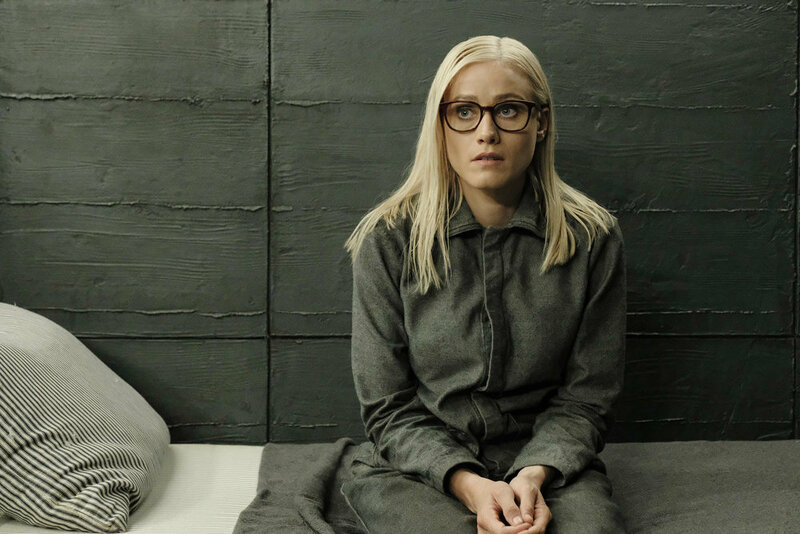 After breaking her agreement with them last season she’s been stuck as a prisoner with only a cellmate next door to communicate with. Zelda pays her a personal visit and brings bacon, the only food that is tempting enough to get the magician to end her hunger strike. Alice immediately knows that the librarian read her book and taunts the other woman about enjoying the part after where she and Q sleep together. The librarian doesn’t take the bait though and only comments that she can’t let the former Brakebills student starve. Alice gives in and takes a piece of bacon and then asks the other woman a question. Zelda doesn’t give her a chance to speak further and says no, Dean Fogg isn’t coming today. But as Zelda walks back to her office, the dean is there hand delivering records of his newest batch of students as mandated by her group. She smiles and says that this is just a formality and that she trusts his judgment and method. However, she asks about Kimber because Professor Lipson reported that she caused a malfunction and the dean honestly answered he didn’t know what caused that. Zelda then adds that Alice is fine, just depressed and angry as always. Fogg notes that she’s fixated on the creature and worried for her friends, but the librarian brushes that concern aside. She then justifies that even though his students saved magic, The Order stepped in as oversight to make everything safer. Unfortunately, it seems that she would not be able to prevent Irene MacAllister from ensuring the questers silence should they ever resurface from their version of the witness protection program. He then comments that his one solace in all of this is that when his attempts to protect his students fail, their blood will be on her hands. Kady’s new identity turns out to be a tough as nails police detective named Sam Cunningham. We find her super pissed off that a guy she just busted got released for some unknown reason. Kady/Sam discovers that he’d been brought in six times previously and never ever got charged with anything. Her partner recommends that she drop it, but of course she can’t so she starts following the dude in question. He spots her easily of course and runs into a store where audiences are shown quickly that there is a star emblem at the door. Kady/Sam follows inside and she flashes her badge to the store clerk before heading to the back. She opens supply room door only to find a mirror with a red substance (probably blood) streaking down. Viewers know that the dude is likely a hedge witch and used the glass surface as a mirror bridge to portal out of there. When she goes back to the front to question the store employee, he shrugs and says that he must have not heard since he had headphones on. We then see that he too has a hedge witch star on his wrist. Kady/Sam’s intuition is tingling and she knows there’s something up with that symbol. Back at the precinct, she starts to google star tattoos hoping to see the one she saw earlier but strange things start to happen. As she is able to find one that mentions hedge witches, her computer abruptly shorts circuits and shuts off. Kady/Sam then writes it down on a notepad when she suddenly knocks her coffee onto it. She heads to the evidence locker where the lights begin to crap out and she relies on her phone flashlight to look at a binder full of graffiti images. The detective finds the one she’s looking for and heads to the site. However, she herself is now being observed by the same guy she was chasing previously. After texting someone else, he uses a spell to try and figure out who she is and a powerful counteractive enchantment is enacted. Fogg’s work is indeed quite sophisticated since it seems that if Kady/Sam comes anywhere near direct contact with the magical world a series of preventative measures occur. If someone from the outside tries to tamper, they are forcefully stopped as well. Kady/Sam is able to locate Mark (the perp) and he explains that he’s only selling charms and enhancements. He has no desire to poke into what kind of witness protection spell she has going on. As soon as Kady/Sam asked if they called themselves hedge witches, a cable satellite dish freakishly comes crashing down on them. Mark soon realizes that she has no idea what he’s talking about and shows her a protection medallion. She rips it from his neck and he runs away from her, only to be suddenly hit by a moving truck. Yikes. Back at her desk, she decides to put on the amulet despite how crazy she feels to see if it actually works. Kady/Sam run a search for Jesamin Lili Cunningham and one result that comes up is a graphic novel entitled A Flock of Lost Birds: A Detective Sam Cunningham Story by James Tiberius R. Martin. She clicks on it and a cover image is brought up that shows her as Sam featuring Isaac Karimov (Josh) and Kimber D’Antoni (Julia) as well. Meanwhile Margo (as Janet) has fallen asleep at her desk and Ember’s voice is overheard telling her majesty to arise. She seemingly wakes up and heads for the door, only to find herself inside the throne room at Whitespire. Ember tells the high king to approach and we find out that he is a projection previously set up by the greatest god of Fillory that was triggered because some catastrophic event has happened to his world. Margo/Janet is confused AF because she has no idea what’s happening. She protests that she is a fashion editor not a king and clearly this message is not for her. Ember gets pissed and commands her to fix this now. 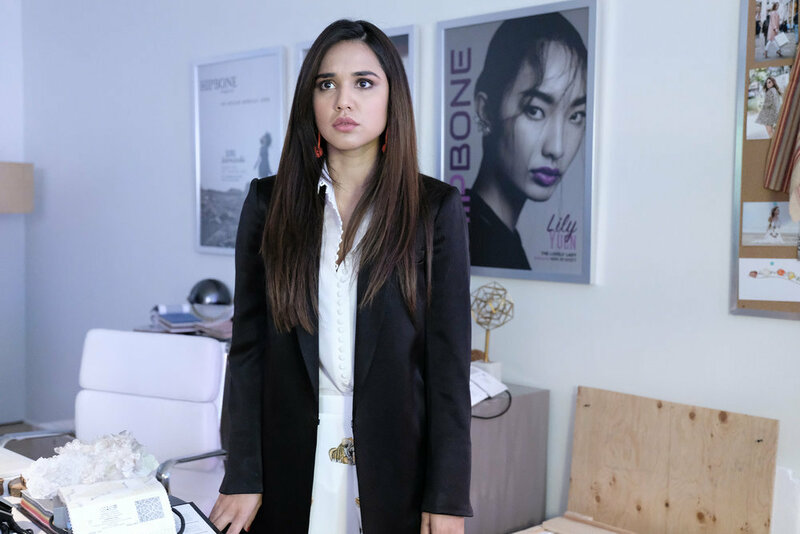 The next morning, Margo/Janet yells at her assistant to set up a meeting because the color correction on the model on the front cover of the magazine is horrendous. She also then complains about her eye seeing weird colors when Sophie hands her an eyepatch and explains that the doctor would be able to see her next week. Margo/Janet reluctantly takes it and starts adds a fashionable accessory to it. She then asks about the books she requested. The other woman remarks that she got locked of the Amazon account and she’s calling around but bookstores in the city are sold out of Fillory and Further. That’s not weird at all. While walking inside the office, the editor is suddenly accosted by Kady/Sam who begins to explain that something really weird is happening to them. The person introduces herself as Sam Cunningham, a narcotics officer with Seattle PD then hands her a copy of A Flock of Lost Birds. Kady/Sam opens to a page with an illustration of Margo/Janet. It’s hard to convince the other woman but the police officer believes that Mark was indeed a hedge witch, that her life isn’t real because it’s all in this graphic novel, something was definitely done to them, and she knows that this all sounds crazy. 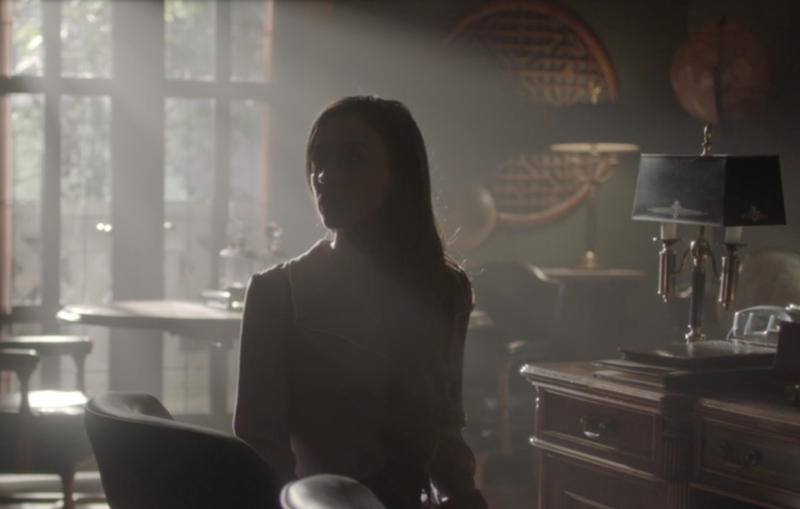 As Kady/Sam asks Margo/Janet to confirm details of her life multiple lightbulbs erupt above them. Convinced, their goal now is to find the other characters in the book and figure out what the heck is happening. Back at the Library, Alice’s next-door neighbor tries to a give a measure of comfort that he’s been in her shoes before and it’ll all be ok. He reveals that he was locked in there because he was trying to perfect a spell to find good children and reward them. Unfortunately, he needed a book that was locked in the Poison Room. Things obviously did not work out and he got caught by the Librarians for possession, murder, and other charges. Alice then asks if he’s Santa Claus and the man tells her to just call him Nick. He attempted to escape a few times in the beginning and even tried to kill himself the old-fashioned way. But his point was that he’s glad he’s still alive and that they’ll figure out a way out of there together. When she asks him why he cares, he responds with Christmas 2004, the pink diary her parents thought her brother got her and vice versa. Nick says that she’s good and he knows she hurt people, but she isn’t a bad person. This is actually a pretty important moment for her character because she had been struggling with the emotional repercussions from her time as a niffin. Last season she decided that magic corrupts no matter what and that the world was better without it. Alice was even ready to drink Fogg’s potion to mind wipe herself and get an entirely new personality. It’s somewhat fitting though that she’s the only one of friends who knows the truth and has to live with the consequences of her actions in destroying the original keys that forced Julia to give her up power, leaving them vulnerable when Irene, the Library, and Dean Fogg showed up at Blackspire. Nick makes her promise to hang in there and she does. However, in the next scene he’s calling out to her frantically and bellowing for help. We see that Alice somehow managed to slit her wrists and was on the floor bleeding out. A panicked Zelda comes in and the young magician is taken to the infirmary for healing. When she wakes up, she’s strapped to a kind of magical oven mitt and sees a cockroach crawling on the floor. For some inexplicable reason she goes after the insect and puts it into her mouth. The head librarian then comes in to check on her and we find out that she’s singled Alice out for rehabilitation because the younger woman has the potential to surpass Fogg, her father, and even Mayakovsky in abilities. Zelda understands that she hates it here but hopes that one day she’ll change her mind and join them. As she is returns to her room, Alice spits out the little cockroach who survived the ordeal inside her mouth. Nick berates her for being stupid to pull off that stunt and she explains that she wasn’t trying to commit suicide. It was just a meant to help her figure out a way to get out of there. Back at Brakebills, it’s discipline day and Kimber/Julia has gone to the dean to talk about her situation. Once again, this moment is a familiar one as back in season one, Quentin himself didn’t have a discipline for a while (until the fifth episode – minor mending). Since Fogg’s own spell is suppressing all of Kimber’s abilities and the poor student is wondering if the others are right that she’s a squib. The term squib is from the Harry Potter series and is a derogatory term for non-magical folks born into magical families. The deans tells her that she reminds him of another young woman who had a similar tenacious mind but he rejected her from the school. Left on her own she got very badly hurt and he just wasn’t willing to make that same mistake again. So he urges her to be patient. Kady/Sam and Margo/Janet are able to locate Isaac/Josh and DJ Hansel/Penny 23. Firstly, how much do I love that Hansel the model DJ from Zoolander is the basis for Penny 23’s alternate persona? The answer is a lot. They are unable to find Kimber (because she’s at Brakebills already), Nigel the illegitimate son of a British lord (presumably Eliot who is now being occupied by the creature), and Brian the English professor. The latter two have both been reported missing by their families. Margo/Janet suggests that they look for the author of the comic book, but Isaac/Josh says that it was written 14 years ago and he has memories from then so what does that even mean? DJ Hansel/Penny 23 asks if the guy who got hit by a truck is still alive because they could ask him some questions. He’s interrupted by the sudden appearance of Marina 23. She also got the hell out of her original timeline last season and she’s here to help them. Looks like she had been the person that Mark was texting under the name scorpion. Fitting description. The hedge witch takes the group back to her stolen condo via mirror bridge and activates her wards. She then proceeds to try a revealing spell on them while holding the protective amulet, but it doesn’t work and they are all knocked out except for Marina 23. Unconscious, Margo/Janet returns to the dreamscape where Ember is once again waiting for her at the throne room inside Whitespire. The manifestation of the dead god is super annoyed of course that the high king still hasn’t fixed matters when she cries out that she’s in New York, not in Fillory. In that moment he thinks he can be super helpful by ending her to the other world. As Margo/Janet wakes up forreal in a forest, she is understandably freaking the hell out. We get an ominous viscous looking hand appear as another mysterious creature is watching her. Meanwhile, Creature Eliot is still with Quentin/Brian and the former prisoner of Blackspire is planning to kill someone in Greece for some grave deed. The powerful being is clearly very aware that a glamour has been placed on Q and even he is unable to break it, having to dance around and call the other man Brian but not really Brian. He then explains that he’s going to have to kill the guy’s friends and so it’s really better that the English professor has no idea what that’s all about. Creature Eliot then leans in and whispers I like you, offering his melting ice cream to the other man. A very disturbed Quentin/Brian leans in to have a bite, since he just witnessed a dude die from not saying there were sprinkles on the cold treat. It’s ironic that in this season, Julia is the only student at Brakebills while the others are out fending for themselves as this is an exact opposite of how it was at the beginning of the series. Clearly Fogg has a soft spot for her even as he doesn’t know that Kimber is actually Julia at the moment. Or does he? It’s not clear if he actually saw the real her through the lens. I’m also wondering what happened to the real Penny at the Library. His soul is still contracted to work for them so will we somehow get him back even though his original body is gone? But since he ate that cupcake last season does that mean that he can never leave the Underworld? It’s very Persephone and the pomegranate seed. Speaking of the Library, I hope we find out more about The Order and what their true goals are. I also can’t wait to find out more about the creature of Blackspire and what his backstory is. 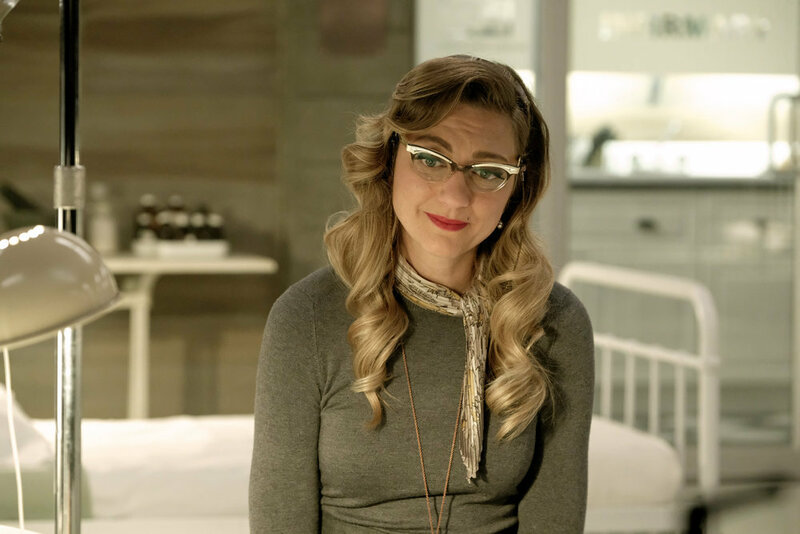 Will The Magicians make me all emotional over another supposed baddie this season? Highly possible. 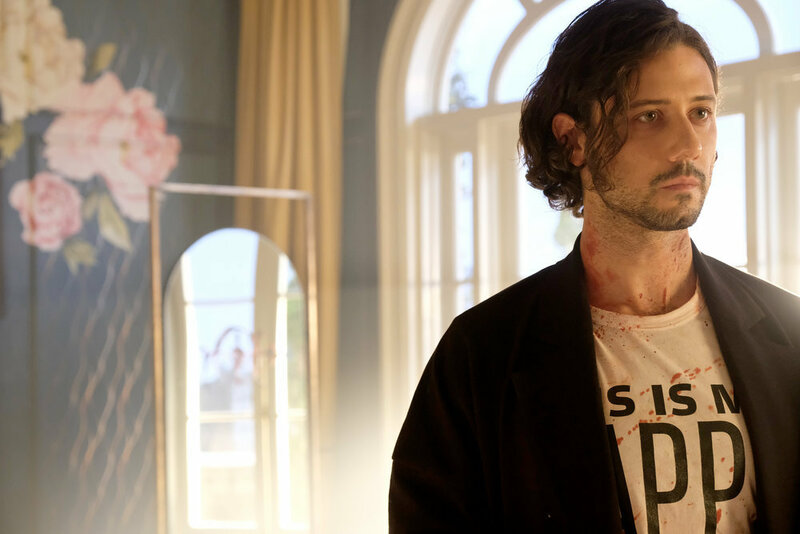 In any case, Hale Appleman is slaying it and showing us this thoroughly disturbing yet childlike character. Now that the show has been renewed for a season five as well, we can all collectively rejoice that this won’t be our last run. Till next week! Does anyone know who played kimbet d’antoni?? ?